These are the products that will prolong your keratin ‘blow dry’. I’ve had four in the past two years. After treatment, it’s recommended that you only use ‘sulphate (detergent) free’ shampoos and conditioners on your hair so as not to strip the keratin from the hair shaft as detergents are liable to do. Don’t be pressurised by the salon into buying their hugely expensive ‘specially formulated’ shampoos and conditioners. 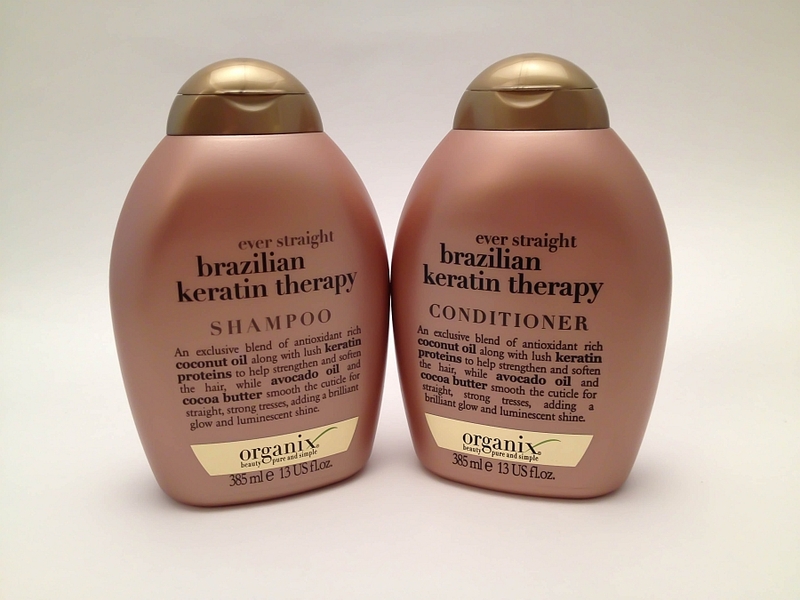 I did a lot of research, as usual, and have used the sulphate free, Organix Brazilian Keratin Therapy Shampoo and Conditioners for the past two years. An exclusive blend of antioxidant rich cocoa nut oil along with lush keratin proteins to help strengthen and soften the hair, while organic avocado oil and cocoa butter smooth the cuticle for straight, strong tresses, adding a brilliant glow and luminescent shine. They have a strong but pleasant cocoa butter scent. The conditioner though, is very thick and absolute murder to get out of the bottle at times. I STILL have to use my tangle teezer even after conditioner, but my treatments have lasted up to 5 months each time and these are the only two products I have ever used. Half the price of the salon products and they help an expensive treatment last even longer, everything I could ask for. Sold in Boots and now Waitrose for usually £6.99 each, try to catch the rare 3 for 2 offers on these generous 385ml bottles as they sell out fast – a lot of women have obviously discovered them! I’ll do a thorough post about Keratin Treatments and my favourite one, Nano-Keratin, and why I think it’s an invaluable investment for older women. These treatments are not just for young girls wanting poker straight hair, it can help vastly improve the condition and look of ‘older’ fine hair too. Some things ARE worth it! Hiya, Were they on special offer? Every time I go there, they’re sold out, I always buy doubles whenever I can. I would say only get them if you have a keratin treatment though. Pre Brazilian Blow Dry days (though Nano-Keratin is THE best) I used Kerastase hair products, the oils are gorgeous, also, Mythic Hair Oil (very light) by L’Oreal who own Kerastase, I’ve used their original hair masque for over 20 years. I don’t think there’s a better hair range out there.